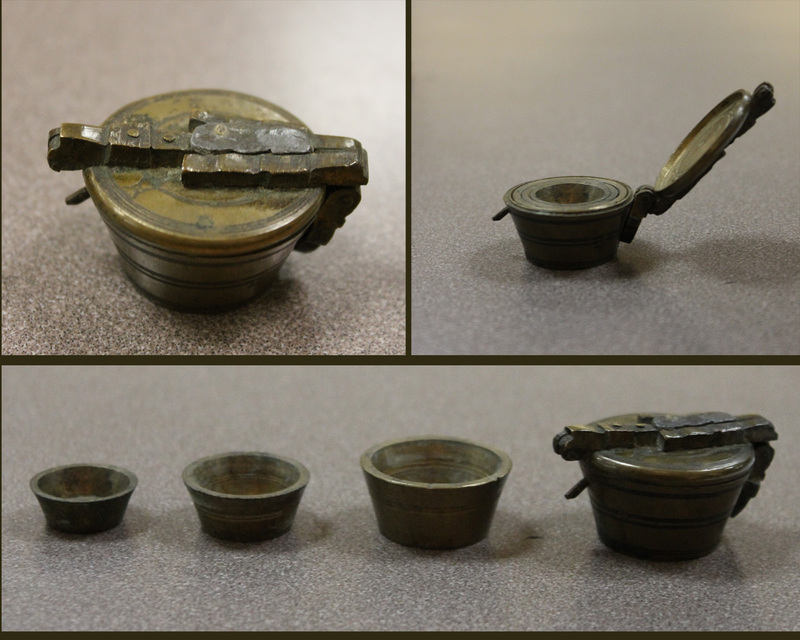 While the Special Collections department has many meticulously documented collections, there are a number of objects about which less is known. 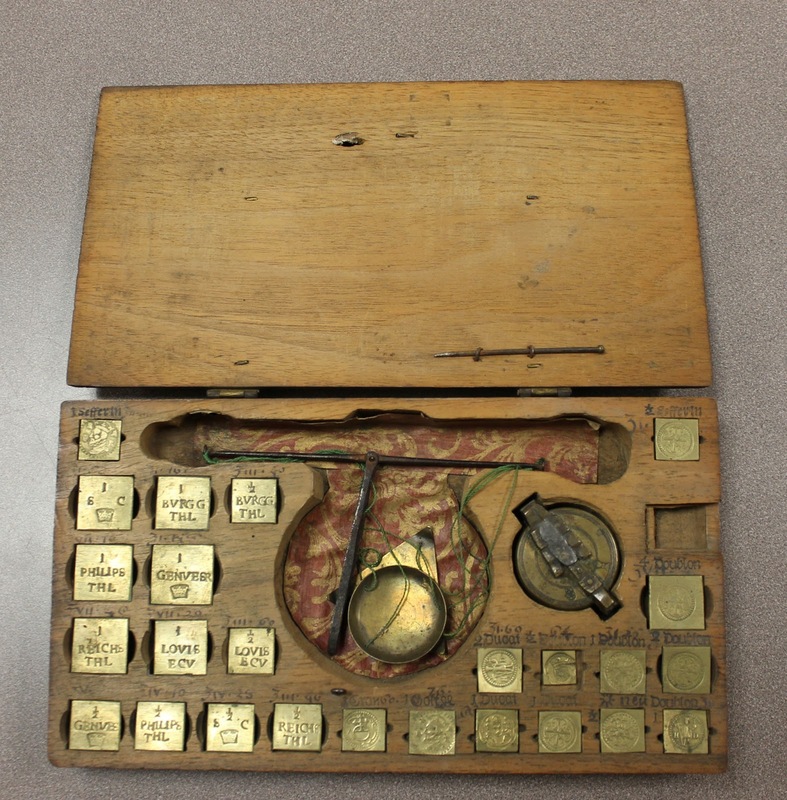 One of these objects is a small wooden box containing a set of scales and various weights. We believe this is a merchant’s coin scale and weight box, and, based on the coins represented on the weights and the mastersign imprinted on one of the scale pans, it was probably made in the mid-seventeenth century in Cologne. 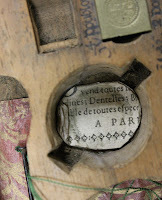 A circle of paper with French printing that cushions the nested weights hints that it may have been used by a merchant in France. 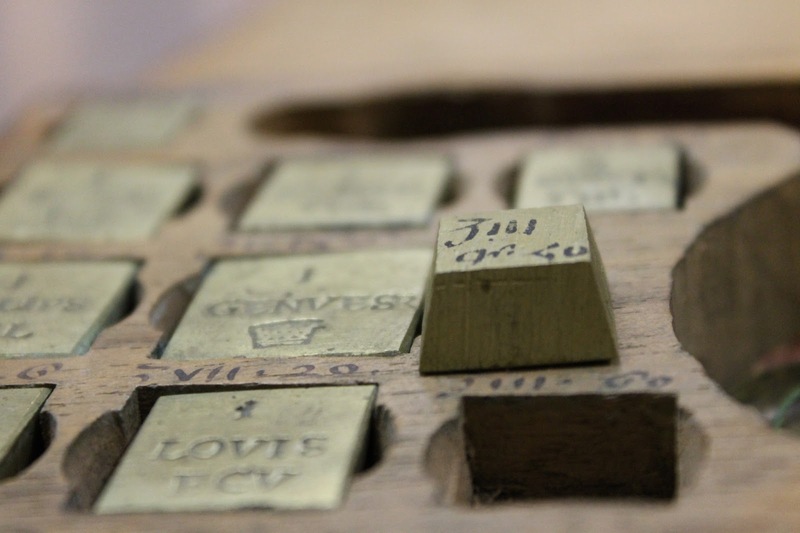 For centuries, the actual weight of a coin mattered, not just the design stamped on it. Merchants would not accept a coin without first verifying its weight, as bits of precious metal could easily be clipped off by people looking to save money. Highly precise scales were made specifically for the purpose of checking coin weights. They were small and easily transportable so merchants could take them with them as they traveled. From the Byzantine period onward it was popular to keep the sensitive scales and their accompanying coin weights together in a small box. Between the sixteenth and early nineteenth centuries, wooden boxes like the one in our collection were particularly popular in Europe. 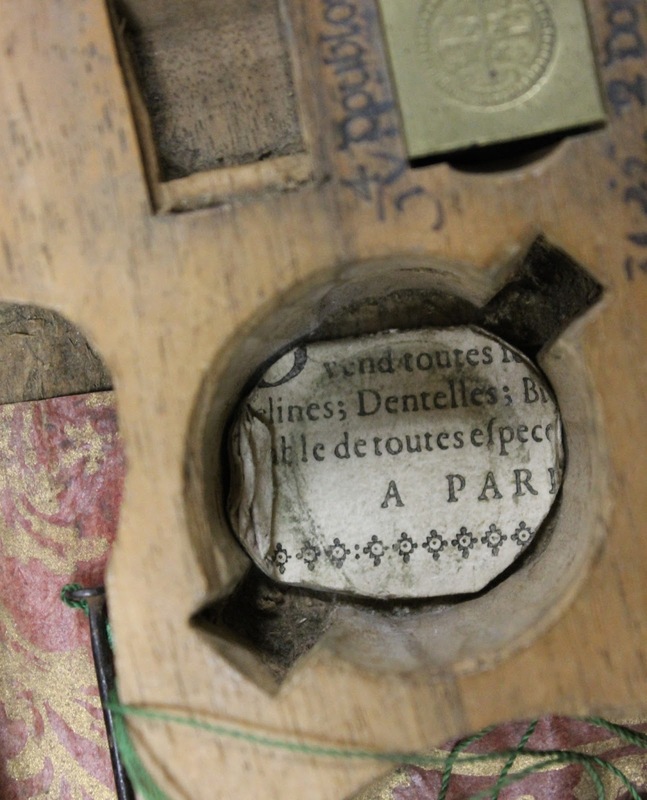 The boxes were designed to fit each component of the set perfectly and were small enough to fit into a merchant’s pocket. 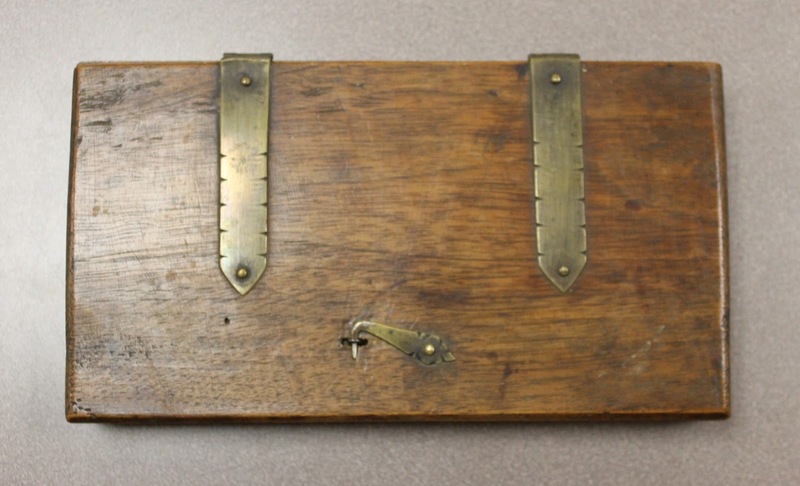 Primarily manufactured in Germany, where special guilds reserved the right to craft them, these scales were popular export items. 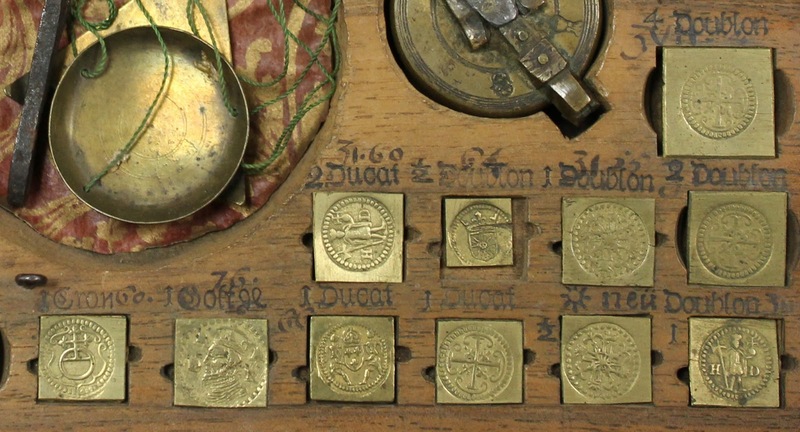 They contained different types of weights for different merchants' needs, although the coin types represented were restricted to those most commonly accepted throughout Europe. 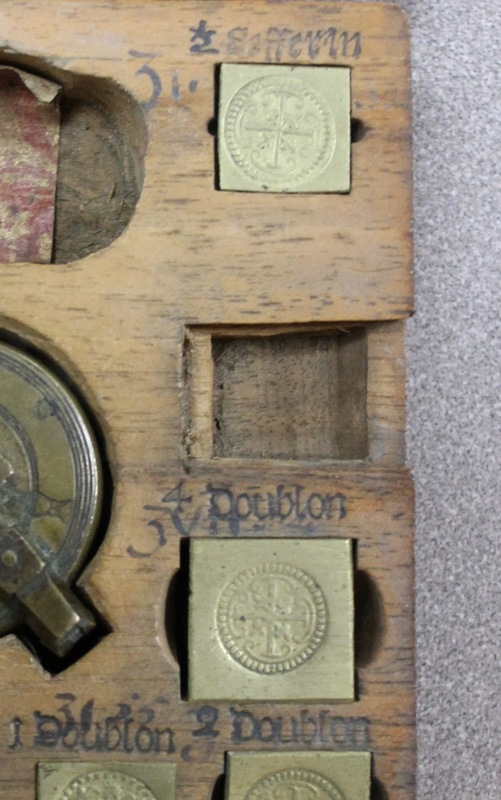 Although the box in our collection bears no identifying marks, it appears that most would have had a label on the inside lid containing information about the box's manufacture and contents. Coin scales were generally equal-arm balance scales, meaning they had two arms of equal weight and length. It was common for the pans to be of equal weight but different shapes. The coin pan was a flat metal triangle, while the weight pan was a round basin. The mastersign of Jürgen from Metz is imprinted on the bottom of our triangle pan. Each pan is suspended by three cords. They were usually made of silk (in Cologne, this was a requirement) and were almost always green, as are ours. There is no definitive answer as to why, but sources such as a 1574 mineralogy text by Lazarus Ercker promote green as a generally relaxing color on the eyes and good for relieving a merchant’s eye strain. This case is designed to hold three different types of weights, all useful to the merchant: nested weights, grain weights, and coin weights. 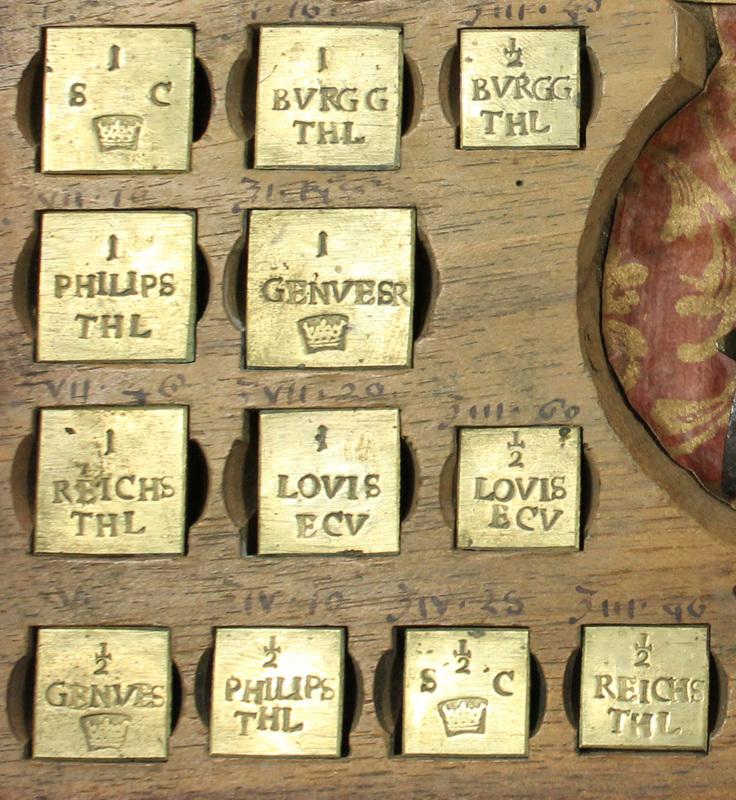 Nested weights were ideal for the merchant as they required a minimum of space. A set consists of cups of descending weight and size, which fit inside one another. The largest cup of the set weighs as much as all the other cups, and each following weight weighs half the amount of the next largest weight. These weights were usually made of brass. Between the sixteenth and eighteenth centuries, Nuremberg held a monopoly on their production and had a specialized guild for their makers. Only in the late eighteenth century did other countries begin to manufacture them. The mastersign on the top suggests that this set was made in Nuremberg. There is an empty compartment on the right-hand side of the box; based on comparisons with similar boxes, this is likely to have held grain weights. The compartment would have had a cover to contain the weights, which were small squares of sheet metal. These weights were used for measuring coins. 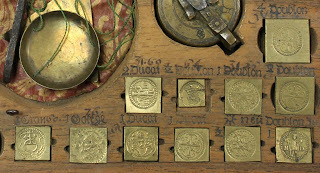 Different regions preferred different shapes for their weights; those in this set are all truncated pyramids.Coin weights not only had to be the exact weight of the coins but also had to be easily identifiable, and as literacy rates were low, many weights were inscribed with full or partial reproductions of the coin whose weight they represented. 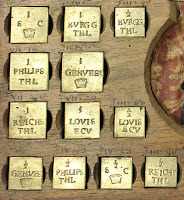 About half the weights in the set have images, while the others have abbreviations of the coin names. In addition to these indications of value, the weights are annotated with information about later adjustments. Kisch, Bruno. Scales and Weights: A Historical Outline. New Haven: Yale University, 1965.